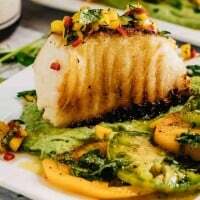 Grilled sea bass in a puddle of avocado crema topped with fresh mango salsa… Mexican Grilled Sea Bass, with its bold Mexican-inspired flavors, is elegant enough for a special occasion, but simple enough for any day of the week! 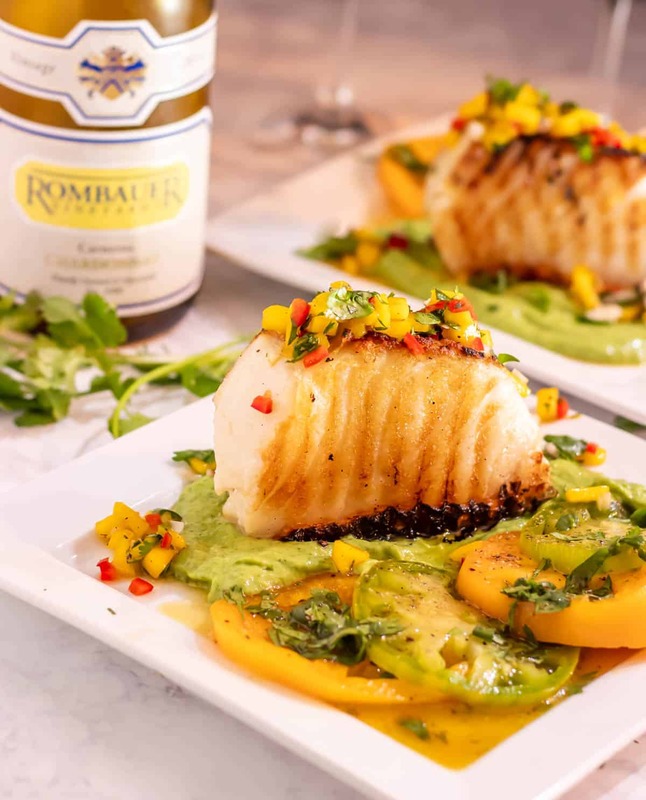 Skip to the Recipe… This is the last “installment” on our fabulous Valentine’s Day meal… unless someone requests the “recipe” for those luscious heirloom tomatoes with cilantro and citrus vinaigrette? If you saw my last post for Mexican Chocolate Mousse With Ancho and Orange, you are aware it was our first course. 😀 The mousse was followed by Oysters With Bacon, Blood Orange, and Jalapeño Mignonette. Lastly, we enjoyed this Mexican Grilled Sea Bass With Avocado Crema and Mango Salsa. What a memorable meal it was! Describing sea bass gets tricky because “sea bass” is a bit of a catch all name for many different types of fish including ocean perch, grouper, black sea bass, even cod. However, if you go to the fish counter and ask for “sea bass,” chances are good that what you receive is Chilean Sea Bass (at least in the United States). Interestingly, though, Chilean sea bass isn’t only caught in Chile, and it’s not a “bass.” In 1977, the Patagonian toothfish got a name change in an effort to improve its appeal in the U.S. market. I think it worked. I’m not sure I would be featuring this ingredient if it were still called toothfish. 😀 It is actually a species of cod icefish. If you are interested in sustainability of fisheries (as I am), The Monterey Bay Aquarium Seafood Watch List is an excellent resource. For a list of responsible choices, check their Toothfish Recommendations. The fishery is mostly well-managed, but there are exceptions. This is a special occasion fish in my mind (sustainability and expense), and I feel good about serving it occasionally, as long as I know the source. I have been “hammering” the idea of mis en place lately. 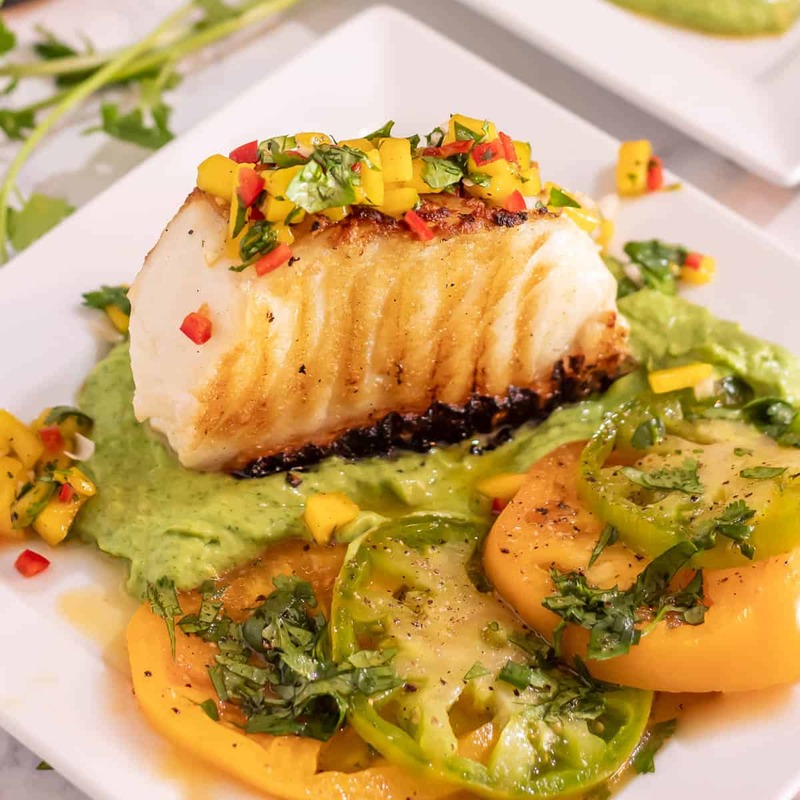 With a dish that cooks this quickly, you need everything prepped prior to grilling the fish – including the avocado crema, the mango salsa, and any side dishes. We opted for heirloom tomatoes on Valentine’s Day; they were lightly dressed with lemon-infused olive oil, orange muscat champagne vinegar, sea salt and fresh ground pepper, and chopped cilantro. My Mexican Cilantro Rice pairs really well with this dish as well. So, prepare the mango salsa and the avocado crema. Rinse and pat dry the fish portions, then rub the oil, and season with salt and pepper. Get any side dishes going. Preheat your grill or stove top grill pan to very high heat. When everything else is ready, cook the fish on both sides (and the top if applicable). My sea bass was about 2 inches thick. I seared it about 1 1/2 minutes on 3 sides… Perfection! To plate the fish, spoon a puddle of that tasty avocado crema on the plate. Top with the fish and a generous scoop of mango salsa. I know you’ll love it. 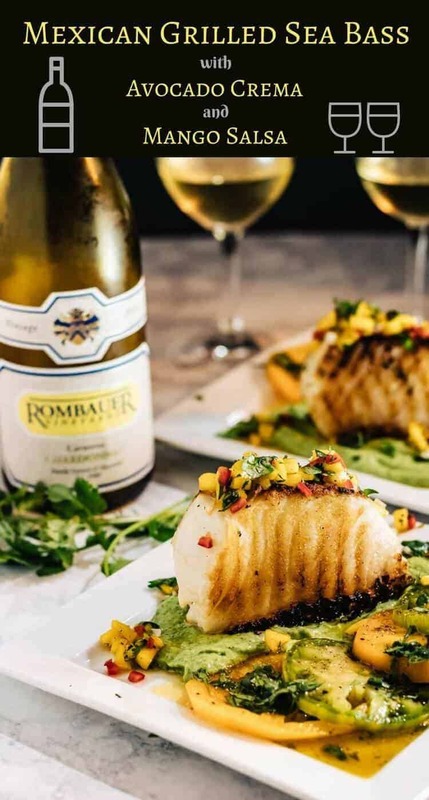 As you can see in the photo, we enjoyed this dish with a bottle of Rombauer Chardonnay. It’s a special occasion bottle for us at about $40.00. We love the balance of oak and fruit, and it pairs well with a bold fish dish like this one. A more moderately priced but solid option would be J. Lohr Chardonnay at about $10.00. A good sauvignon blanc or white bordeaux would be fabulous as well! Combine all ingredients for the Avocado Crema in the blender or food processor bowl. Pulse until smooth. Season with salt and pepper. Check seasoning and consistency. Add additional buttermilk if desired. Set aside. Combine the Mango Salsa ingredients in a prep bowl. Stir and check seasoning. Set aside. Rub fish portions with oil. Sprinkle with salt and a few grinds of pepper. Grill over medium high heat on all sides until you get a nice sear. Cooking time varies according to thickness. I did about 6 minutes total on my thick portions. Garnish with a bit of chopped cilantro. Substitute your freshest firm fish that can stand up to high heat and grilling... salmon, mahi mahi, shark, etc. Be careful with grilling time as you don't want to overcook fish. Obviously the size of avocados varies. Start with about 1/3 cup of buttermilk, and add until you have the consistency you like. I go with something like pancake batter - pour-able but thick. Be sure to taste for seasoning! An exact quantity of lime juice is not required. Sometimes I use 1, and sometimes I need 2. If the limes aren't juicy, you may need 3. You want enough juice to stir into the salsa, but it doesn't need to cover the ingredients. 2 to 4 tablespoons is about right. Macronutrients (approximation from MyFitnessPal): 422 calories; 36 g protein; 16 g fat; 37 g carbohydrates. Hi. So how do you make those heirloom tomatoes? Everything looks amazing. Hi Michelle! Thanks for stopping by! The citrus vinaigrette on the heirloom tomatoes is pretty simple... To a small blender or processor, I add 2 tablespoons good, mild vinegar (I love Trader Joe's orange muscat, but a champagne, white wine, or sherry vinegar is fine), 2 tablespoons citrus juice (I used blood orange), 1/4 cup extra virgin olive, 1 teaspoon dijon mustard, 2 teaspoons honey, 1/2 teaspoon salt and fresh ground pepper to taste. Our local farmers' market and our HEB always have beautiful heirloom tomatoes. I hope you give it a try! Oh wow, we just finished this and of course now I think I should have taken a picture. Mine looked exactly like yours and I know that you eat with your eyes first. But in the end it is the taste that matters and this was fantastic. Thank you, thank you, thank you. Oh wow, this looks amazing. I love the combo of avocado and mango. Almost too pretty to eat! Almost, but not quite... Right? Avocado and mango seem made for each other. Thanks for stopping by!